Success in asset management is as much about personalities as it is about performance. The "personality premium", a premium investors are willing to pay to have a specific individual manage their money, can vary significantly across investment funds funds with similar performance. Rarely is such premium more extreme than in the case of Bill Gross of Pimco. It is best observed in closed-end funds, exchange traded fund vehicles that have a fixed number of shares. 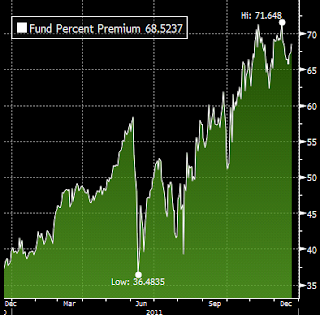 No two funds are alike, and in addition to the personality premium, the fund's track record, management style, portfolio composition, etc., can all have an impact on the premium or discount to NAV. To gauge the premium one can therefore look at funds in the same asset class managed by well recognized large organizations. Let us compare two closed-end high yield bond funds, one managed by Pimco, the other by Wells Fargo. The Pimco fund is called "Pimco High Income Fund" (PHK) and the Wells Fargo fund is the "Wells Fargo Advantage Income Opportunities Fund" (EAD). Both have a similar net expense ratio of just over 1% and both have the bulk of the assets in junk bonds. PHK has about $1.4 bn is assets, while EAD is about $0.65 bn. First we compare the funds' year-to-date returns. 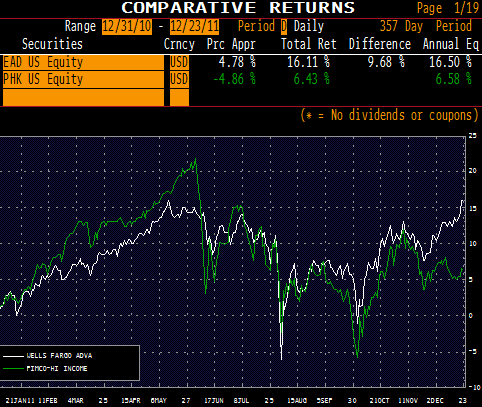 EAD is clearly the winner with 16% total return vs. Pimco's PHK of 6.4%. Often superior returns are achieved by taking higher risks, potentially via higher leverage or higher duration. 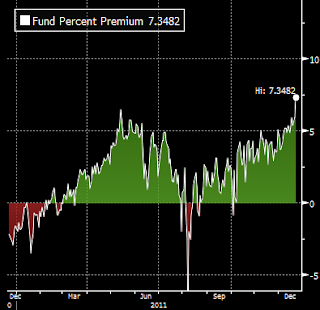 So our next comparison is the relative risk profile of the two funds. A very simple way to measure this is to run a shock scenario on the funds' holding by widening spreads of the portfolio bonds. Below is the 100bp shock scenario comparison between the two portfolios. EAD NAV would end up dropping by 14% if all bond spreads widen by 100bp and by 13% if only the high yield bonds are widened by the same amount (both funds hold some investment grade bonds.) The corresponding numbers for PHK on the other hand are down 20% and down 19%. What this is telling us is that PHK is more risky than EAD, mostly due to the fact that PHK has a higher average duration of 6.5, vs. EAD's duration of 3.4. EAD assets have a slightly lower average rating, but PHK holds more financial sector exposure. Now that we've established that EAD has a better performance and lower risk profile than PHK, let's take a look at the two funds' premium to NAV. EAD trades at 7.3% premium to NAV, which is quite reasonable. Pimco's PHK on the other hand trades at close to 70% premium, almost 10 times the premium of the Wells Fargo fund. Those who purchase PHK therefore pay nearly 70% more than the value of the assets held by the fund just to have their money managed by Pimco. We've shown that it's not the performance, particularly through this crisis, and it's not the risk profile that can account for such drastic difference. The premium difference between these two funds of over 60% is in fact the "personality premium" commanded by Bill Gross. An obvious question here is can this be turned into a trade, such as going long EAD and shorting PHK. Such a transaction is difficult to achieve because PHK is notoriously hard to borrow in order to short it. And the outcome is by no means certain because the personality premium could persist for a long time as people continue to watch Bill Gross on CNBC and pay enormous premiums for the honor to have their money managed by such a celebrity.